Incredible day @ayewriteglasgow ✨ amazing ✨ So at the end I was approached by a member of the audience who had seen @theheraldscotland today. She’d read my six page feature and had asked why I thought the paper didn’t opt to use me for the cover of the actual magazine. 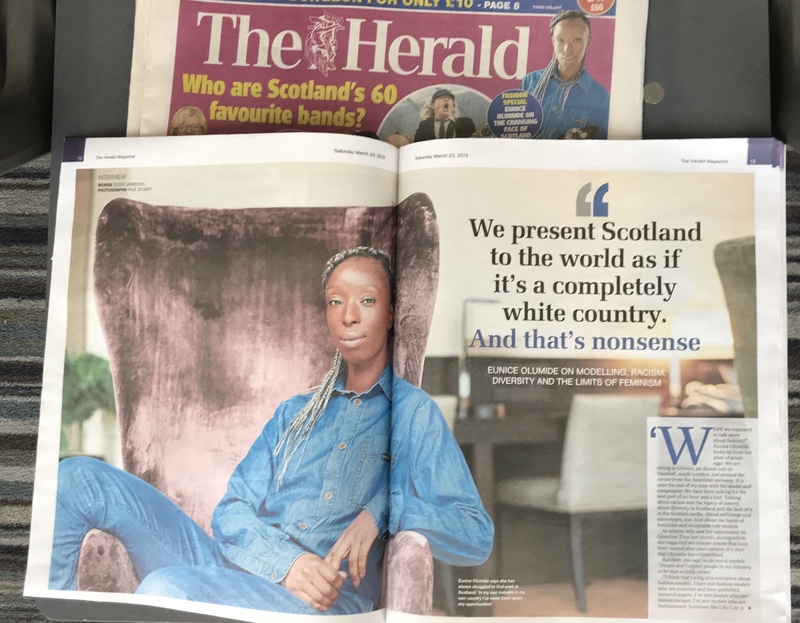 I hesitated.. She then asked me ‘is Scotland racist?’ I hate to say I am regularly asked this question when working abroad, and I rushed out to go and get a copy! I could see where she was coming from. The paper clearly didn’t acknowledge my very clear articulation that to the rest of the world we are not celebrating diversity and worse come across as being against it @visitscotland Even when members of BAME groups are over achieving. If this is true I will accept it but the Scotland I know is socially welcoming and actually politically we’re the most diverse in the UK. Why is our media so far behind? I keep reading.. so the cover image came from the inside fashion editorial which I felt were beautiful images, but pretty outdated. Scottish people deserve more. I was more concerned to see young girls selling products that they would never wear, aimed at women in their 30’s and 40’s. I was further saddened that the team are all female @eva_arrighi @kirstyandersonphoto Although they may not have chosen this, its simply not good enough with #me2 in this day and age for us to expect men to change but for women to continually represent other women in this deeply repressive manner. Encouraging mental health issues and insecurities that are fundamental to ageism and women’s role in the work place. I had a look @theheraldfashion IG and was again disgusted to see 100% homogenous white female image being used, never mind models with disabilities or plus size women. Or who look like their readers! You are keeping Scotland in the dark ages. Fashion has always been about revolution, anarchy and agitation. Not just being comfortable and supporting out of date representations of women that hold us back. Subsequently although it was a lovely feature 🥰 I simply cannot support or be associated with publications or organisations who do not understand their social duty to society.